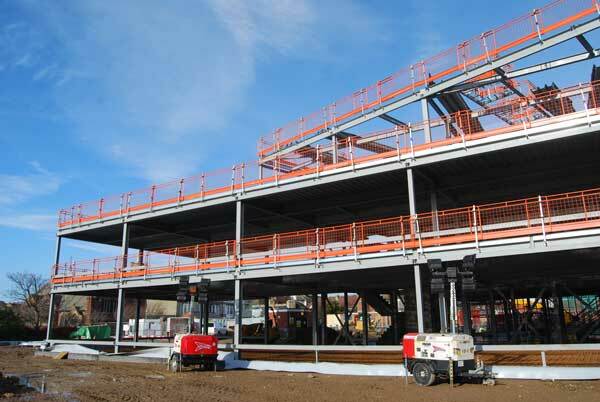 Working on behalf of Morgan Sindall, H Young Structures has completed the main steel frame for the new £18.3M headquarters for the Centre for Environment, Fisheries and Aquaculture Science (Cefas) in Lowestoft. As well as the sustainable landmark new build structure, the development includes the refurbishment of an existing 1980s laboratory building. Facilities currently housed in the adjacent former Grand Hotel and Experimental Block will be rehoused in the new build, allowing these two old buildings, which are deemed inefficient, to be demolished, thereby freeing up a large part of this seafront site for extensive landscaping and car parking. According to Cefas, the new facilities will create greater opportunities for collaboration and innovation among the organisation’s employees, local marine and research networks and the international scientific community. The new building will house offices and meeting rooms, arranged either side of a spacious double-height glazed atrium and main entrance. On plan, the structure is a skewed H-shape, with a two-storey part along the left side and a two and three-storey element on the right.